My name is Esther Behfar. I’m the mother of five adorable troublemakers, wife of Rabbi Daniel Behfar, and a third grade Secular Studies teacher in Brooklyn, NY. This blog is a where I share Torah thoughts and ideas, and where I hope to interact with my readers! Please read, share, and comment so we can grow together! Hi! Thank you for visiting my blog! 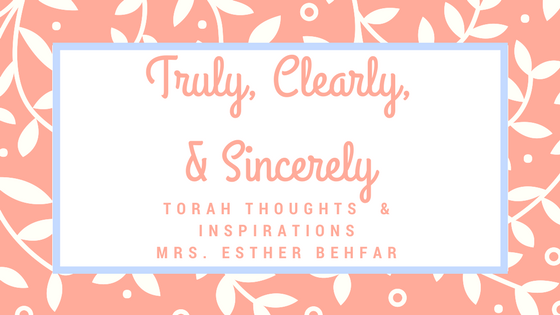 I’ll be posting weekly thoughts, musings, and divrai Torah, as I live my life aiming for a true, clear, and sincere derech in Avodas Hashem.